The focus is on leading a gentle, inviting conversation. Many economic analyses are full of urgent 'ought-to' messages, leaving audiences and readers feeling somewhat drained and powerless. This book seeks to make people feel empowered as they read. Readers should be creatively empowered to “add to” the story of the mosaic and personally empowered to take small positive steps to build their own careers, support others in their career development, or know that they can have a positive impact on the economic development of their communities. The subject of today's economy has never been a topic of conversation that I have eagerly entered into, as the discussions tend to lead to negativity and despair. However, after reading this informative and encouraging book, I find myself wanting to look deeper at my own career development, and the steps that I have taken to get to where I am in my current career. Also, in my work as an Internship Coordinator, I am constantly emphasizing to my students the importance of developing "soft-skills" needed for career success, and that these skills are transferable to any career. After reading this book, I will now have further information to provide the students regarding first career steps and the "bigger picture" relating to the exciting mosaic economy which they will become an integral part of! I found this book fascinating. I have never studied or been interested in economics so this book was a great introduction for me. 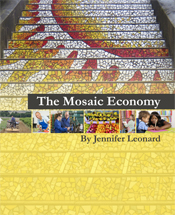 It is peppered with contemporary and understandable examples of the economic principles that Ms. Leonard is describing. I see life from a new view! Initially I bought this book to inspire a young new entry into to the work force. As an older reentry into the work force, I found that it was just as relevant to my situation. It was nice for a change to read about the flexibility of the American economy instead of the usual epitaph on an economy that is far from dead.